What’s cooking in on Pauline-Cuisine? The temperatures are going down and it is time to cook some warm food for lunch. This week, I tried to cook with Tofu. Indeed, I heard a lot of good things about it and I quite remember that the taste is not really strong, I just cooked it once and I was not convinced. But I gave it a try this week again. I decided to cook it with vegetables on a kind of Chinese way. When I removed the Tofu from its package, the texture was really fluffy. I sliced it in square pieces and decided to fry it on my “barbecue” pan. I put one spoon of toasted sesame oil and when the pan was hot, I added the Tofu pieces. I let them cook for 10 minutes before turning them back. I think that was the right technique in order to keep the Tofu in bites. Then I added all the vegetables and some seasoning with Chinese spices and Soya sauce. 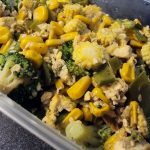 This dish is really easy and quick cook and it is delicious to eat at lunch for your lunch break. I hope you will enjoy cooking this new recipe for your lunch box. Have a nice week and see you next week with another tasty recipe.